Zimbabwe’s finance minister painted an optimistic outlook for his country on Tuesday, despite protests over fuel prices that human rights groups say have left at least a dozen people dead. 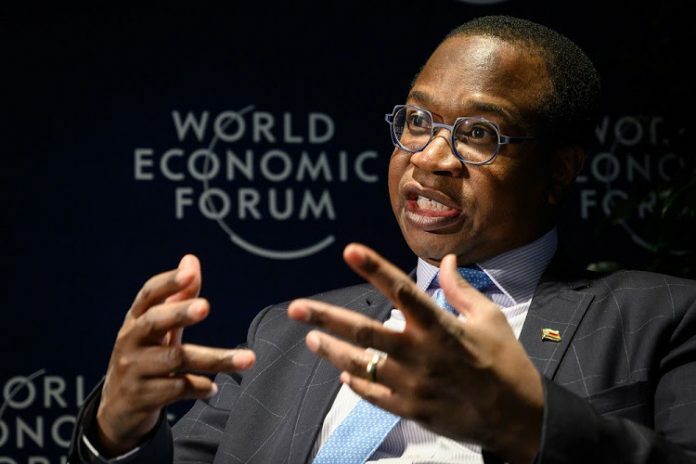 Mthuli Ncube says that in the next year he hoped to bring inflation under 10 percent from 42 percent now, find the money to cover debt payments of $1.2 billion and introduce a new currency. He also talked up a privatization programme that has so far seen little real progress. “Zimbabwe is the best buy in Africa right now,” he said in an interview at the World Economic Forum in Davos. Zimbabwe is facing its most serious economic crisis in a decade. Shortages of food, fuel and foreign currency are testing the government of President Emmerson Mnangagwa, who was voted into power after the overthrow of Robert Mugabe in 2017. The government recently raised the price of fuel, which sparked protests across the country. Human rights groups say Zimbabwean security forces used live ammunition to quell them. Ncube, a former banker whose appointment last year was meant to signal a new focus on the economy, said Mnangagwa had issued “a very clear statement to say that violence is really not allowed, that violence is un-Zimbabwean on both sides”. He said any abuses by the security forces would be punished. “It is precisely because of the opening up of the democratic space that this (the protests) has happened,” he said. Zimbabwe owes US$7.4 billion in external debt and needs to pay $1.2 billion of that in 2019, most of it to the World Bank and the African Development Bank. Ncube says he is speaking to G7 countries to find a way to make those payments. Neighboring South Africa has recently raised the possibility of financial aid for Zimbabwe. Ncube said he would welcome anything they could offer. One of the country’s biggest problems is the dysfunctional currency market. For the past few years, Zimbabwe has used an electronic dollar that is officially pegged one-to-one with the U.S. dollar. The black market rate is around four-to-one. Ncube wants to introduce a new domestic currency within a year. That process, he said, might involve a change to the official rate because it was impossible to completely deal with “the distortions that continue to fester”. Ncube said a trip that he and President Mnangagwa just took to Azerbaijan, Belarus, Kazakhstan and Russia had provided ideas that Zimbabwe was keen to copy, especially on managing natural resources and using the proceeds to fund development.